Simon Mignolet (5.1m) retains his spot in our lineup thanks to a hat-trick of clean sheets in the 1st three games of the season. Alternatives: Joe Hart (5.6m) has kept 3 consecutive clean sheets as well so far and you can confidently handover the gloves to him as City has a streak of easy fixtures lined-up ahead: WAT, CRY, WHU. Aleksandar Kolarov (5.7m) has had a great start to the season. 1 goal, 3 clean sheets, 7 bonus points and 31 points in just 3 games! The serbian is known for his attacking instincts along the flank and his consistent performances paired with easy fixtures ahead make him a no-brainer selection for this week. Nathaniel Clyne (5.5m) and Matteo Darmian (5.7m) retain their spots in our squad thanks to their clean sheets as they face not-so-formidable opponents West Ham and Swansea respectively. Targett (4.0m) and Oxford (4.1m) have also been retained for now mostly because of their lucrative prices. Alternatives: Sagna (5.1m) is a good budget alternative for Kolarov and is showing signs of a price rise in the coming gameweeks. Only a single change to our midfield this week as Nathan Redmond (5.6m) earns a spot with 2 goals and 1 assist in 3 games. The Canaries visit Southampton who have had a lackluster start to their season with no wins so far. Redmond has contributed with 5 goals and 5 assists in his last eight league outings and is an excellent budget friendly option this week. Riyad Mahrez (6.0m), Sanchez (11.0m), Silva (10.1m), and Albrighton (5.1m) have been retained in our squad this week. Mahrez is FPL’s top scorer with 4 goals, 9 bonus points and a whopping tally of 35 points. His price has gone up by half a million within the first 3 gameweeks. Leave him out at your own risk! Sanchez didn’t score against the Reds at the Emirates but he impressed us with his attacking play around the box and you can count on him to open the scoring for this gameweek as the Gunners face Newcastle at St. James’ Park. Alternatives: Yaya Toure (8.8m). 2 goals, 2 assists and those City fixtures! Eden Hazard (11.4m) and Pedro (9.5m) of Chelsea have also been impressive in their last game and could be good differentials as they face Crystal Palace at Stamford Bridge this week. After scoring a whopping 20 goals for the Cherries to help them win the Championship title last season, Callum Wilson (5.5m) had a slow start this year in the Premier League. However, he found his form last week having scored a hat-trick against West Ham United and bagged 3 bonus points as well. With a streak of easy fixtures ahead (LEI, NOR, SUN) Wilson surely comes in as an easy pick to beat the cash crunch. 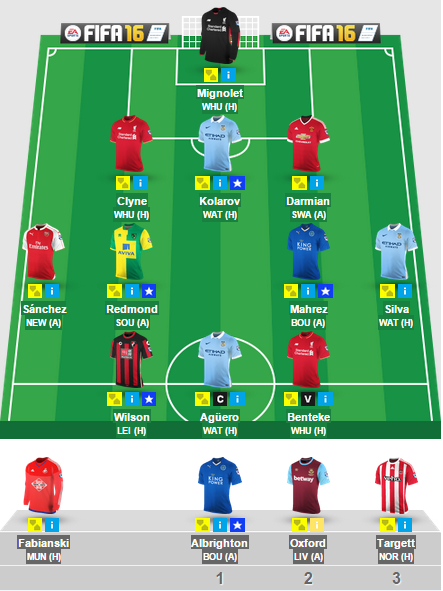 Aguero (13.2m) and Benteke (8.5m) have retained their spot as well as they face fairly easy opponents at home. Alternatives: Jermain Defoe (5.6m) scored a hat-trick against Exeter City in their midweek Capital One Cup fixture and took his tally to 5 goals in 3 matches. He is a good budget alternative this week as the Black Cats travel to Villa Park on Saturday. This entry was posted in General, Squad and tagged english premier league, EPL, Fantasy Football, fantasy football squad, fantasy football tips, fantasy football transfers, fantasy premier league, football transfers, Gameweek 4, Transfer Tips. Bookmark the permalink.